This easy to grow crop can be grown in any containers, but requires direct sunlight throughout the day. Potting mix and other manures may help better production. Introduction and Uses: Use Cherry Tomatoes to get an instant burst of color and flavor. 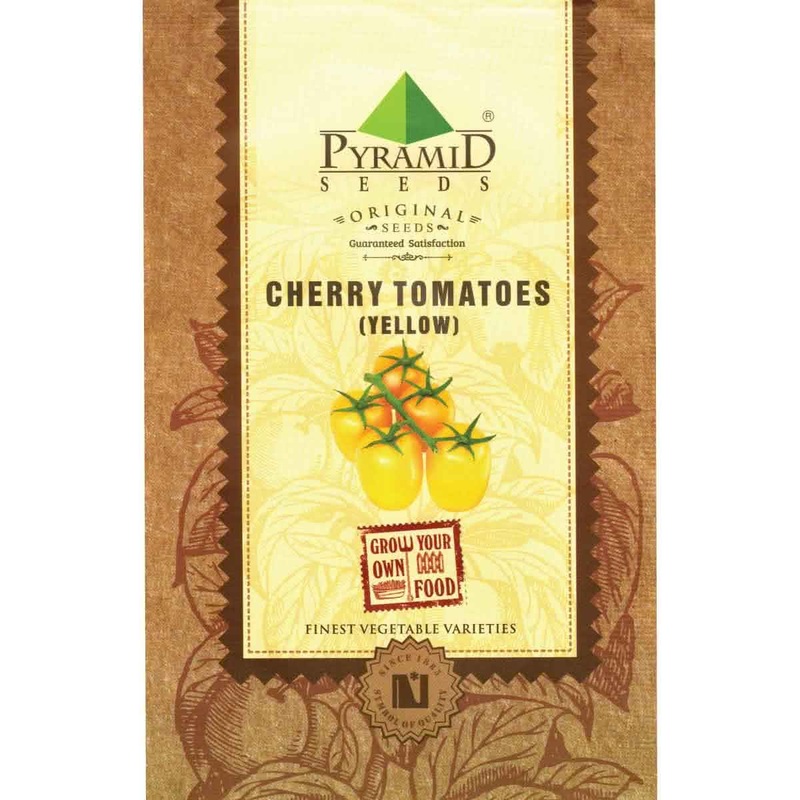 This extremely versatile variety of tomatoes is used to lend a sweet juicy flavour to salads, salsa, pizza and pasta. Cherry tomatoes are easiest to grow and are the first to fruit. They include both bush and climbing varieties, and all bear prolifically. Because the seeds are small, Cherry Tomato plant is grown by transplantation method. Seeds are first sown indoors in seedling tray or outdoors on seed beds. Later the seedlings are transplanted into containers or in raised beds. Hold the Cherry Tomato seeds on your left palm & sow 2-3 seeds per cell/cup. Since Cherry Tomato seeds are small, avoid sowing them very deep. Water the seed cells with a spoon in the first week. Provide 2 tablespoons of water every day. First leaves: First leaves will emerge above cotyledons at the end of the second week. These are Cherry Tomato's original compound leaves. Ideal planting mixture for Cherry Tomato: 2 part garden soil & 1 part organic manure. Transplant the seedling along with root ball of a medium, without disturbing its roots. Unlike other plants, Cherry Tomato seedlings can be transplanted deeper into the soil, so that little portion of the lower stem & leaves can be buried inside. This encourages more root formation. Sunlight: Cherry Tomato plants require full sunlight. Therefore your raised bed should be made at a bright sunny spot. Keep the potted Cherry Tomato plant in sunlight. Watering technique: Water your potted Cherry Tomato plant every day in summer & every other day in winter. Water at the soil near the plant. Use a watering can and make sure that the plants get water in the form of a shower & not by a single flow. You can also make provision for watering by watering by drip irrigation system for your raised beds. Avoid overwatering. 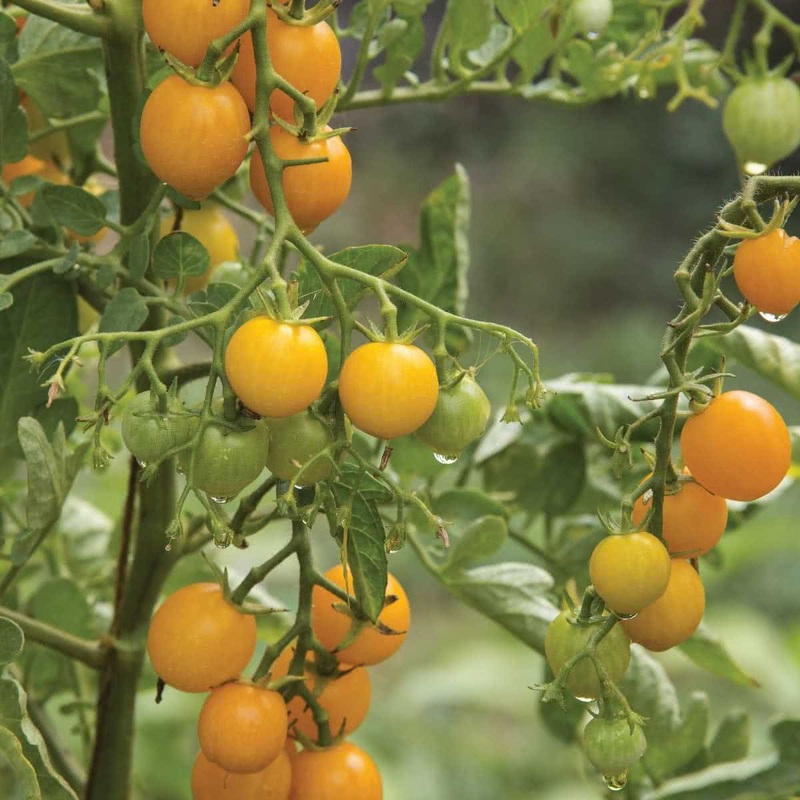 Trellis: Cherry Tomato is a weak trailing plant that requires the support of a trellis, particularly at fruiting stage. Use locally available material like bamboo, wood sticks, wires, tapes, ropes to make trellis of your own. Pinching: Pinch off the unwanted extra side suckers (shoot buds) that develop on the main stems & keep the number of growing branches limited for better yield & bigger Cherry Tomatoes. Also pinch off any diseased leaves & branches immediately. Harvesting: Cherry Cherry Tomato plant will start flowering at the beginning of 3rd month, Cherry Cherry Tomatoes can be harvested 60-70 from the sowing of seeds & harvesting season can continue for next 3 months or so. Germinated quickly. The plant looks healthy. ... and had a high yield. The tomatoes were delicious. Will definitely buy again.